The cuban singer/songwriter releases her 4th album. Addys Mercedes has many stories to tell: Grown up in a modest family in rural Cuba, she recalls her youth: A soapbox cart („Carrito de Cartón“) she made with her brothers, and – in her dreams – taking her to Havana. Or the old ferry, that dropped anchor in her hometown Moa and gave Addys the first regular stage to perform (Ahí). 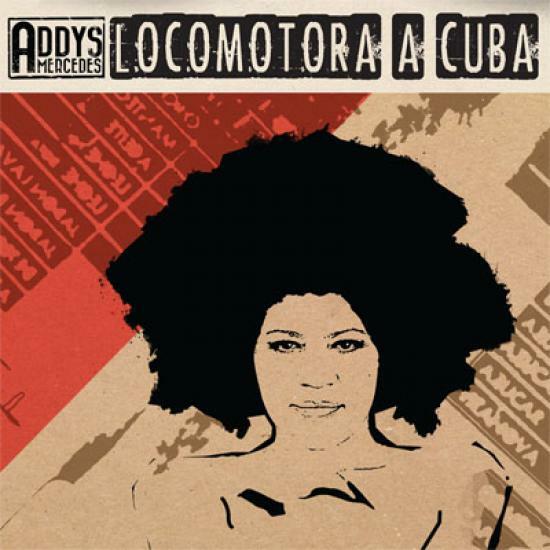 In the meantime Addys Mercedes moved to Essen/Germany and her new album „Locomotora a Cuba“ bridges the gaps between the cultures: The experiences and everyday objects, she would like to take to Cuba and the liveliness and warmth, she aims bringing back to Europe. The home station now is her family, that accompanies her whereever she travels. Her daughter Lia (13) is fascinated by classical music and studies violin at the conversatory. After recording just a few lines on the previous album „Addys“, her violin now had a decisive impact on the sound of the new songs. A tradition of cuban Charanga orchestras in the 40’s that almost fell into oblivion. Also joining the tours is her life partner Cae Davis (bass, guitar, percussion) and the „adoptive uncle“ Pomez di Lorenzo (guitars, ukulele, tres), with whom she also teams up for the songwriting. Addys loves to be on stage, the uniqueness of the moment beeing close to her audience. A feeling she succeeded capturing on this album. With this cuban train, restless shuttling between Cuba and Europe, she satisfies her homesickness and curiosity discovering new borders. 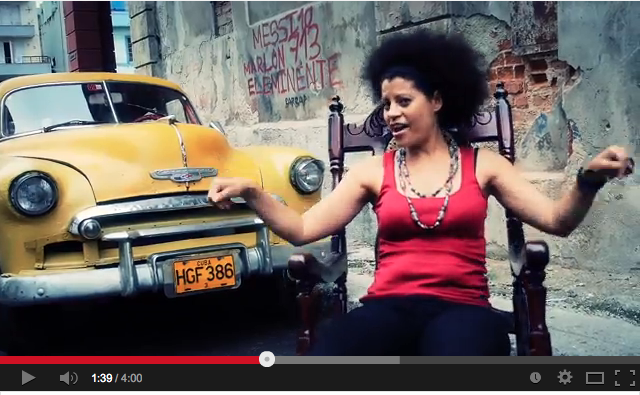 Addys Mercedes not only keeps cuban music vivid in Europe. Last december she escaped from geman winter and toured with her familyband through her old home country. They played acoustic concerts in living rooms, streets and cultural centers. Her single „Rompe el Caracol“, where she sings – „the police is gone and the pastor is sleeping, get out of your shell and enjoy the moment“ – spoke out of the bottom of the heart of the audience and resulted in spontaneous parties. Her compatriots rediscovered their distant musical daughter. The single hit #90 of german radio charts. But especially the softer moods and subtile musical moves are leaving space for her great voice. The yearning ballad „Atrapa los Sueños“ (hold on to your dreams) moved the cuban audience deeply. Since it’s written in the stars if there will be another oportunity to listen to Addys’ verses, they quietly listened to every word. It’s been 20 years that Addys has not sung in Cuba. Nevertheless during the house concerts neighbours knocked the door and asked wether they have heard Addys’ voice. As a teenager she used to pass by their houses and sing some of her new songs in times where there was no TV in most cuban homes. For them Addys left Cuba, a country that couldn’t exist without music, far too early. In Cuba Addys Mercedes started touring as lead singer of son-orchesters and had the opportunity to learn from experienced musicians during daily rehearsals. But as a young girl, in a heavily-male-dominated music world, it would have been dificult to proceed her own ideas. Only after moving to Europe she got the chance to further develop musically, taking classical vocal lessons, learning guitar and performing her own songs in concerts in 17 countries with legends like Eric Clapton, Bob Geldof and Ringo Starr. In her traditional debut album „Mundo Nuevo“ (2001) Addys described her arrival in Europa, while in the following album „Nomad“ (2003) she started mixing with electronic elements. With her third album „Addys“ (2012) she arrived in this new world and started touring with her family band. Maybe it was the look from outside, that allowed Addys to discover the beauty of her home country. Thoughtful stories from the colonial era („Negrito Congo“), about social imbalances „No Queda Nada“ (nothing left for us) or playful moments traveling to a cuban party („Bembé“) – her unique voice takes the listener to a journey – far away from stereotype tourist beaches, but full of surprises. Welcome in the train to Cuba !